The gaming sector is a surprisingly good place for investors to find strong, consistent payouts right now. Today, investors looking at the casino resort operator don't see a growth company at all, and they shouldn't. It has transitioned into a cash-flow machine, and that's why I think it's time to look at Las Vegas Sands' dividend as a great buy in the gaming industry. Las Vegas Sands was in expansion mode from the time The Venetian Las Vegas opened in 1999 until The Parisian in Macau was completed in 2016. Throughout that period, the company was constantly planning or building new resorts. But there aren't any new projects on the horizon now, and Las Vegas Sands has entered a phase of its life where it may not grow at all. Because of that, the key performance metrics for investors to watch have shifted from revenue growth to cash flow generation and what's ultimately returned to shareholders. You can see in the chart above that in the past year, Las Vegas Sands generated $4.9 billion of EBITDA, a proxy for cash generated from resorts and casinos. That's a tremendous amount of cash flow for a gaming company, and it's funding the company's growing dividend and share buybacks. Management has increased its dividend to $0.75 per share quarterly, which yields 3.8% at today's stock price. 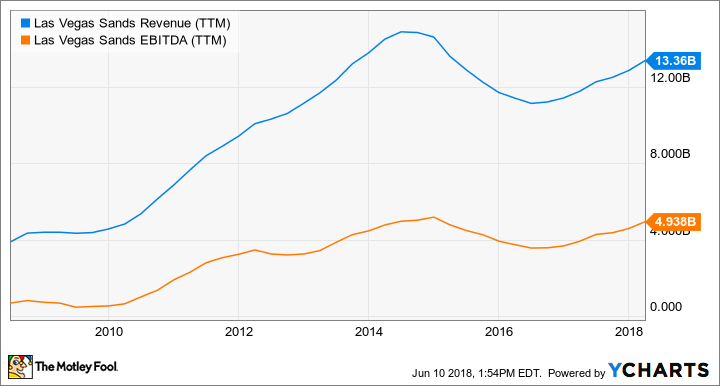 You can see in the chart below that about 60% of EBITDA is being paid out in dividends, leaving ample cash for other purposes -- like stock repurchases, which have picked up in recent years. In the last four years, Las Vegas Sands has repurchased about 30 million shares, and management just increased its buyback authorization by $940 million to $2.5 billion. That's on top of the $16.2 billion it has returned to shareholders since the beginning of 2012. 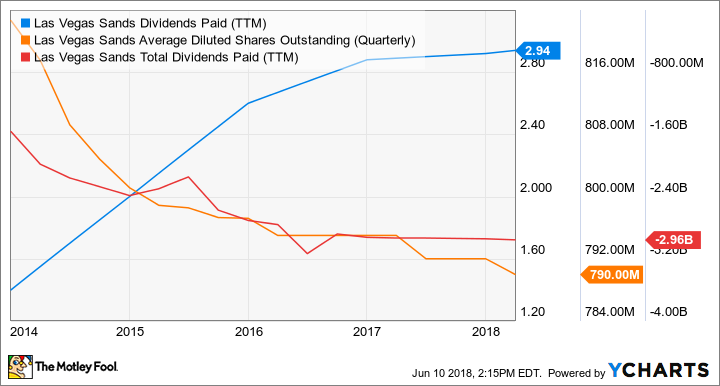 Management has demonstrated that it's not interested in letting cash build up on the balance sheet, so its reasonable to expect it will increase the dividend or accelerate share buybacks if there's cash available. Given the billions of dollars coming from the gaming business today, that means a steady stream of cash going to shareholders. When Las Vegas Sands was building new resorts, it was pouring billions of dollars into its infrastructure. Now, that upfront money has been spent, and the company is reaping the rewards of two decades of development. Management expects to spend about $500 million annually on maintenance capital expenditures, which leaves about $4.4 billion in excess cash flow each year to pay dividends or buy back shares. It's the consistent cash flow that makes Las Vegas Sands my top dividend stock today, and if the entertainment and gaming industries continue to grow worldwide, the company's cash flow generation could increase over the long term, providing further upside to investors.